Author: Stefan Elders †. Edited by: Gudrun Miehe, Pascal Boyeldieu. Series edited by: Gudrun Miehe, Brigitte Reineke, Manfred von Roncador. 22 pp. Roman, 648 pp. Kulango is spoken in the Northeast of Côte d’Ivoire, in the Zanzan region, as well as in neighbouring Ghana, in the Brong Ahafo region. It is separated into two major dialect groups, the northern branch centring around the village of Bouna in the East of the Parc National de la Comoë. The southern variant is concentrated around the settlements of Bondoukou, Tanda and Nassian. There are some 142,000 speakers of the Bouna variant in Côte d’Ivoire and 15,500 in Ghana, while about 70,000 people in Côte d’Ivoire and 27,000 in Ghana speak Bondoukou-Kulango. A third, minor dialect called Nabay is isolated to two villages in the Northwest of the Parc National de la Comoë. Kulango is part of the Gur language family, a sub-branch of the Niger-Congo languages. With Teen and Loma, so-called Loron languages spoken in the border region of Côte d’Ivoire and Burkina Faso, it forms the Kulango-Loron subdivision of Gur. 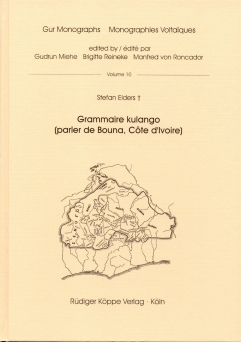 This grammar focuses on the Northern dialect of Kulango as spoken in the village of Bouna, the historical centre of the Kulango kingdom described by Boutillier (1993). According to the informants it is the more conservative variant of the language. The result of numerous research trips to the area in the years 2000 and 2001, this present work offers a synchronous description of phonology, morphology and syntax of the language under description. Some aspects of word formation processes are described, as well, putting them into context with other Gur languages. A compendious book of this nature is most likely to be used for reference on particular topics, than read through or explored for ideas. The author is careful to define the major technical terms relevant to each chapter, but he does not engage in extended argument. [...] In sum, the book represents a very considerable contribution to the linguistics of West Africa, and is a fitting monument to its author.